Inhumanoids is a horror show. I have no idea how it was marketed for kids. With its disgusting abominations and political backstory, you'd expect to see this on the X-Files, not in a cartoon. I went back and took a look at the mini-series that started the whole thing and for a villain that didn't even show up until the third episode, Metlar has one hell of a reputation. Out of all the bad guys in every cartoon I watched, this guy has to be one of the single most powerful bastards around. Sure, he's got one hell of a weakness (magnetism freezes him in place), but he's immune to lava and laser fire, he's strong enough to rip stalactites off cavern walls and throw them, and can bring statues to life with Primal Energy. He's even got the worst case of heartburn I've ever seen with a mouth literally filled with lava that he reaches into to throw fireballs. But then again, he's vulnerable to sunlight and worse yet, he needs help from his lackeys to get up once knocked on his back. At first I wondered why exactly he was the leader of the Inhumanoids, considering his two lackeys were so insanely powerful. 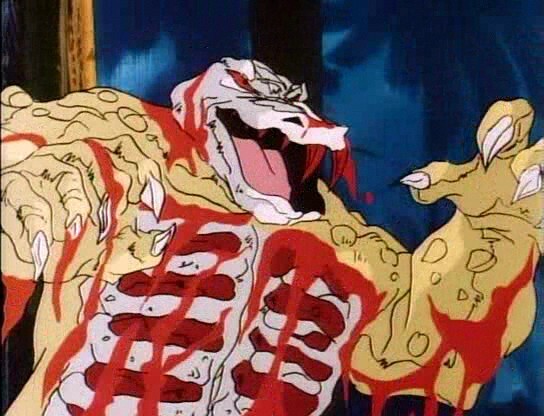 You've got Tendril, a giant plant monster who can regrow limbs and create copies of himself from those lost limbs, and the most nightmare-inducing thing to ever grace cel-animation, the zombie-creating D'Compose! They're already capable of wiping out their enemies, the scientific minds of Earth Corps, what did they need Metlar for? And what kind of plans would a monster like him even come up with? I thought as I went into it that they were all mostly-mindless monsters bent on random destruction. But no, Metlar has a brain in that ugly mug, one that comes up with scheme to collect Primal Energy by detonating a nuke in the Earth's core. Sure it would kill practically everyone (including Tendril and D'Compose, who he neglected to mention), but that's the price it takes to create his endless statue army. Before we get to any ratings, I want to give second place to another villain, Blackthorn Shore. It's almost a toss-up on which villain in Inhumanoids was really the worst. This guy, who probably has the most intimidating name in the cartoon, not only discovered the Inhumanoids, but released them on the Earth from their eternal prisons. He even builds a suit for himself after forcing a Senator to shut down Earth Corps and hand over their blueprints. He builds magnets into his suit to control Metlar and when they fail, he gladly goes along with Metlar's plan and helps him steal the missiles he needs in exchange for control of one of the remaining islands after the Earth melts down. If not for being knocked cold by a punch from the Earth Corps leader, he might have gotten the spot of top bad guy in the whole cartoon. But back to Metlar and let's rate this guy! Coolness - 5. I really want to give this guy a higher score, but in the end, he loses points just because his lackeys are way cooler than him. Both of them have more frightening looks and D'Compose gets a way better voice actor with Chris Lotta. Ed Gilbert, just cannot compete with that, especially with that weird warble they added. But he still looks impressive with his weirdly clawed hands, chainmail torso, and fiery mouth, so I'll give him a middle score. Effectiveness - 6. 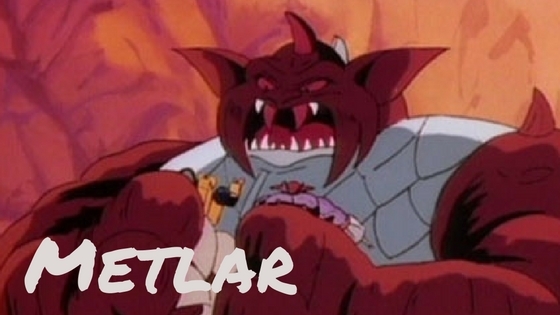 Metlar knows how to get things done. He commands his lackeys even while locked away in a magnetic forcefield, he creates an army of Civil War and Greece statues, and he completely annihilates a Soviet missile base. He came within just a few shots of destroying the Earth and even forces someone that once tried to control him into working for him. That's more than impressive, that's straight up admirable. I'm hard pressed to think of any villain that can top that.